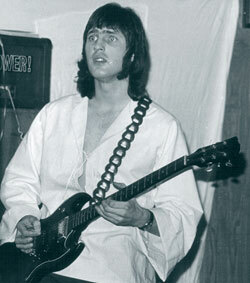 The Gibson SG (short for Solid Guitar) is a classic design from 1961, much loved by the heavy rock community. It looks a bit devilish doesn’t it? Also the upper frets are very easy to reach for those scorching face-melting solos. 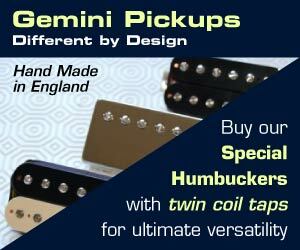 It comes equipped as standard with two powerful humbuckers, great for high gain playing. One little problem for me is the balance in the feel, the one I’ve played the Gibson SG Custom tends to feel a little neck heavy, as do others so I have heard. So you can strap it on tight or wear a high friction T-Shirt to stop the nose diving. I feel the power of the SG! The Gibson SG is probably the fourth most cloned guitar design, I’d put the order of cloned shapes popularity as follows; Strat, Les Paul, Tele, SG, 335, PRS, Flying V.
For me the SG has always been a desirable guitar because of my favourite bands. As a younger teenager I first bought the AC/DC album “If you want blood” in 1979, it features a mock up photo of the guitarist Angus Young impaled through the stomach on his Gibson SG! Later in my teens my favourite band became Black Sabbath whose lead guitarist Tony Iommi has always seemed to use Gibson SG guitars. The Tony Iommi signature Gibson SG is one of the coolest guitars around. Now I still listen to those bands quite a lot, they still feature in my MP3 playlists. Anyway, being a design type I’ve been tweaking and adjusting Gibson SG shapes just like I do with the logos and designs in my work when clients ask for a ‘refresh’ while retaining brand identity – that kind of thing. I’ve read Kerry’s articles about balance, movement, lines and shapes etc on this very site but for me I just try and make things that look nice or cool, that’s the start and end of my ‘fiddling with design’ process. During that time I’ll try and work with alternative and new shapes and ‘what ifs’ as they pop into my imagination, sometimes they turn out good, I think an improvement, sometimes just odd. Let’s look at my main 5 ideas in the illustration. The first alteration was an offset back, so the rear body of the Gibson SG is simply skewed until I like the look of it. Everybody tends to prefer the upper part of the guitar to be looking ‘forward’ so that’s the way I skewed it, also it is possible to help the balance of the guitar with the weight offset / body lengthening. This idea is taken further for the “IG” italic G (var. 5). I actually think this shape is the same shape as one ESP has used to make a kind of SG ‘tribute’. Hey, maybe my ideas aren’t that stupid after all! ESP have been thinking along these lines and seem to have produced something a LOT like var.5 above! It’s a pretty hot looking SG I think, also nicely ‘relic’-ed in the example below. Secondly (var.2) I thought a cool design change would be changing the convex bottom of the guitar to a concave shape, in some ways the new shape accents the pincers at the front of the guitar. The SG Arrowback guitar. I wouldn’t merely carve the bottom away to make the concave because of the neck heavy properties of the original would be made worse. 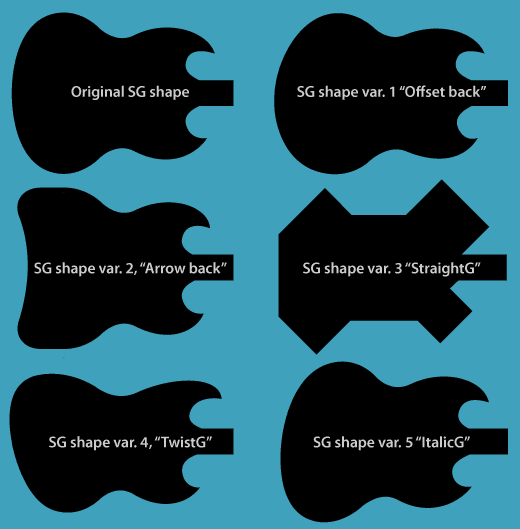 In var.4 I put the original SG shape though a 3D twisting algorhythm in Adobe Illustrator. This is the Twist G or the TG… For me this could be the “Fender SG” it just looks like those two ideas married together. One thing is that the upper back wing could have it’s curve tweaked a bit more and it would be a cracking shape for a guitar. If anyone wants to make one let me know and I can tweak it. As usual leave your comments and helpful suggestions/links below. Mark.